Emiliano Alfaro Toscano is an Uruguayan footballer who currently plays in the Indian Super League for Pune City FC. He started his career for Liverpool Montevideo as a wily striker. He was highly prolific for them and the European clubs came calling. However, he got a large chunk of his success in the Middle East and is currently bossing defenses in the ISL. Emiliano was born on 28 April 1988 in Treinta Tres, Uruguay but he also holds an Italian citizenship. He was scouted into the Montevideo based Liverpool at a young age where he developed into a goal poacher. His understandinding of the game and ability to steal goals for his team earned him the nickname El Picaro meaning The Thief. 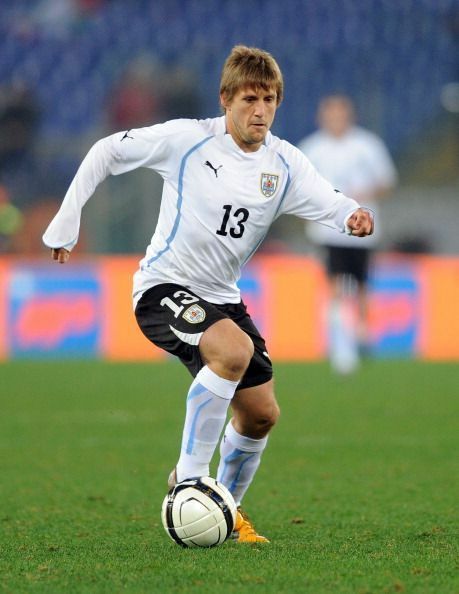 Emiliano was in the Uruguay squad in 2005 South American U-17 Football Championship which finished as runners up. He had also represented his country in the U20 level. He put in appreciable performances for Liverpool and a noteworthy 2009 domestic season where he scored 13 goals in 15 games pushed him to national team reckoning. However, he had to wait for his national team debut. He earned his only appearance for the La Celeste in 2011 against Italy in Rome. Uruguay lost the match 1-0. Emiliano has been a globetrotting journeyman. Starting in Montevideo based Liverpool, he had a brief loan spell for Argentine club San Lorenzo. An uneventful European stint at Lazio closed the doors for a national team comeback. He had loans spells back to Liverpool and UAE based Al Wasl where he was in scintillating goalscoring form. His career could not take off at Lazio and ever since that he has been restricted to playing in the fringe leagues. He joined Thai champions Buriram United but an injury did not allow him to play and the contract was terminated without Emiliano making a single appearance for the club. He even endured a period as a free agent after that. Brief period of struggle was finally lifted when North East United bought him in the 2016 ISL draft. His was a constant threat and scored 5 goals in the season. He played for a UAE second division side Al Fujirah before getting picked by Pune City FC in the ISL 2017 draft. He made a smashing start to the season and netted 4 goals in first three games for Pune. He has emerged as the chief marksman for Pune as they aim to qualify for their first ever semifinals.